The white-tailed deer is tan or brown in the summer and grayish brown in winter. It has white on its throat, around its eyes and nose, on its stomach, and on the underside of its tail. The male has antlers. Males weigh between 150 and 300 pounds and females weigh between 90 and 200 pounds. The white-tailed deer is found in southern Canada and most of the United States, except for the Southwest, Alaska, and Hawaii. A deer's home range is usually less the a square mile. Deer collect in family groups of a mother and her fawns. When a doe has no fawns, she is usually solitary. Male bucks may live in groups consisting of three or four individuals, except in mating season, when they are solitary. The white-tailed deer lives in wooded areas. In some areas, deer overpopulation is a problem. Gray wolves and mountain lions are predators of the white-tailed deer and help keep their population under control, but because of hunting and human development there are not very many wolves and mountain lions left in most regions of North America. Sometimes a bobcat or a coyote will kill a young deer, but people and dogs are now the deer's main predator. Because there are not many natural predators, deer populations can sometimes grow too large for their environment and deer can starve to death. In rural areas, hunters help control deer populations, but in suburban and urban areas where hunting is not allowed, deer populations can grow out of control. Other things can change deer populations. Disease and parasites like lice, mites, and roundworms can weaken or kill deer. Young deer and old deer often get sick and die, especially in the winter. Winter is a dangerous time for deer. Their long narrow legs and pointed hooves make it hard for them to move around in the snow and ice, and it is easier for predators like dogs to catch them. Deer and people are living closer to each other because of human development and growth in both deer and human populations. Because humans and deer often share a habitat, there can be problems for both of them. When a deer's habitat becomes smaller because of human development, deer often eat food from yards and gardens. Deer need to cross roads to look for food and water and are sometimes struck by cars. People can also catch a sickness called Lyme disease from the deer tick. The white-tailed deer is an herbivore. It follows well-used trails to its feeding areas. It feeds in the early morning hours and in the late afternoon. 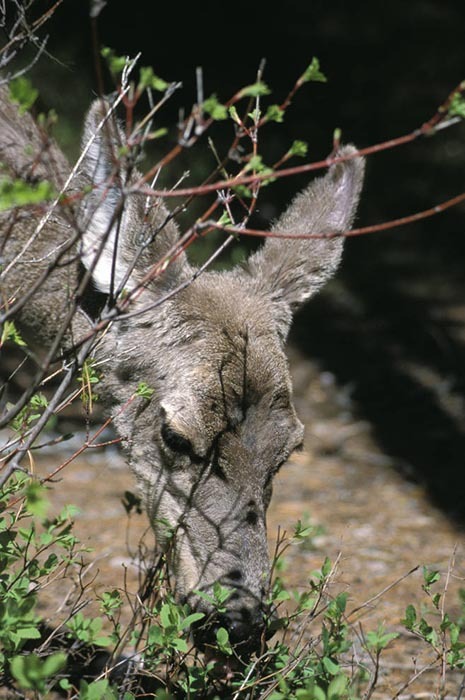 A deer's diet changes depending on its habitat and the season. It eats green plants in the spring and summer. In the fall, it eats corn, acorns, and other nuts. In the winter, it eats the buds and twigs of woody plants. The white-tailed deer is a ruminant. Its stomach has four chambers for digesting food. In the first two chambers, the rumen and the reticulum, food is mixed with bile to form the cud. The cud is regurgitated and re-chewed and swallowed. It passes through the rumen to the omasum where water is removed. Finally, the food enters the last chamber, the abomasum, where it is sent on to the small intestine where the nutrients in the food are absorbed. This digestive system lets the white-tailed deer eat foods like woody plants that other animals can't digest! If deer have enough food, water, and shelter, their population can grow very quickly. Cows, bison, bighorn sheep, goats, llamas, camels, and giraffes are also ruminants. White-tailed deer mate in November in the northern parts of their range and in January or February in the southern parts of their range. The female has 1-3 fawns after about six months after mating. Fawns are reddish-brown at birth with white spots that help camouflage them. They can walk at birth and forage for food a couple of days later. They are weaned at about six weeks. The mother leaves her fawns well hidden for hours at a time while she feeds. If she has more than one fawn, she hides them in separate places. While they are waiting for their mother to return, the fawns lay on the ground with their heads and necks stretched out flat on the ground. This makes it harder for predators to find them. Female fawns may stay with their mother for two years, males usually leave after a year. When a white-tailed deer is alarmed, it may stomp its hooves and snort to warn other deer. It may also "flag" or raise its tail and show its white underside. When a mother deer is running, this white underside can help her fawns follow her. White-tailed deer are very good runners. They can run at speeds of up to 30 mile an hour. They are also good leapers and swimmers.